In Joe Rao's "Looking Up! 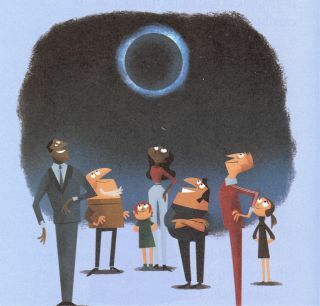 : The Science of Stargazing," illustrated by Mark Borgions, children learn how to safely view the 2017 total solar eclipse. Meteorologist and Space.com skywatching columnist Joe Rao was 7 years old when Charles M. Schulz, to use Rao's own words, "really blew it." It was the week leading up to the total solar eclipse of July 20, 1963, and the Peanuts creator had devoted a six-day story arc to the astronomical event. Reflecting on that comic strip decades later, Rao said Schulz really missed the mark. "I looked at that and I said, 'How could he do that?'" the FiOS1 News meteorologist recounted. "He's giving the impression that a total eclipse is the worst time, but that's the time when you're supposed to look, and that's the most beautiful time." It might have taken 54 years, but Rao is righting Schulz's erroneous, if well-meaning, recommedation. In "Looking Up! : The Science of Stargazing" (Simon Spotlight, 2017), Rao's second fact-filled primer for children, the author takes pains to assure his young readers that they can — and should — seize the opportunity to view, with their naked eyes, the moment when the moon completely envelopes the sun. Remember: It's important to avoid looking directly at the sun before it is completely covered without using special eclipse glasses. "The most beautiful and spectacular part of the eclipse is the total phase, when it's completely covered and you see the corona and the stars come out, and the horizon lights up with sunrise and sunset colors," said Rao, who also serves as an instructor at New York City's Hayden Planetarium. "It's beautiful, but people are under this misguided impression that that's the worst time to be outside, the worst time to look, and that was what I was trying to push or stress in the book, to the kids especially." Readers won't have to wait long for that opportunity. On Aug. 21, the United States will fall in the path of a total solar eclipse — the first to be visible from coast to coast since 1918. "I hope we don't have people, Americans, at the moment just before the eclipse is total, say, 'All right, it's total, guys. We have to go inside. We can't look,'" Rao said. "That would be terrible if that would happen." But Rao's enthusiasm for astronomy is most palpable in the final chapter, about August's "path of totality." He even directs readers to place a "big red circle" on their calendars so they don't miss it. Rao said he hopes the eclipse will pique children's interest, just as the one in 1963 did for him, despite Schulz's misinformation. "I think we're seeing, with this eclipse coming up, a big, big turning point — a big event that's going to maybe be the starting point for a lot of young people to get interested in astronomy and space and science in general," he said. "And I think it's going to be the biggest event, media event in terms of space and astronomy, going back to the first launch of the space shuttle, maybe even the old moon shots back in the late '60s and early '70s. It's going to be a big, big thing." You can buy "Looking Up!" on Amazon.com.